While the hockey world is watching some crazy first-round action in the Stanley Cup playoffs (who would have thought the wild-card Columbus Blue Jackets would be up 3-0 on the Tampa Bay Lightning? ), Vancouver Canucks fans are watching other fans’ teams play and looking to their own team’s future. In this set of news and rumors, I want to focus on the young Canuck prospects or potential Canuck players. Here’s a look at the upcoming NHL Draft, and two of the young goalie prospects already in the system. Item One: Might the Canucks Trade Up at the NHL Draft? Jason Botchford reported on TSN Radio in Vancouver that the Canucks might be considering trading up to draft defenseman Bowen Byram. He noted that the Canucks have shown interest in Byram, but they are obviously not alone. The New Jersey Devils and the New York Rangers have shown the most interest, and they are choosing 1 and 2 in the Draft. That doesn’t bode well for the team’s chances. 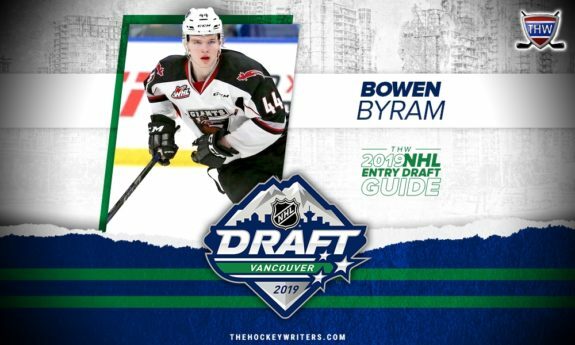 On March 22, Canuck reporter David Quadrelli of the Canuck Way made a strong case that the Canucks should choose Byram if they had any chance to do so. According to Quadrelli, Byram is by far the best defenseman in the Draft. Byram, who plays for the Vancouver Giants of the Western Hockey League, has scored a remarkable 26 goals and 45 assists so far this season for the Giants. And, he’s only 17 years old. On April 11, Last Word on Hockey’s Ben Kerr did an update on Soderstrom’s progress this season in the Swedish Hockey League. He pointed out that the 18-year-old defenseman has already been playing games against much older men when he began suiting up for the Brynas main club. And his four goals and three assists in 44 games give Soderstrom the season’s lead for most points by an under-18 player in the SHL. Soderstrom has a history of success at every level he’s played. For example, he led the Swedish Under-18 league in points by a defenseman and led the league in assists in both 2016-17 and 2017-18. What’s remarkable about these numbers is that they were compiled when he was only 15 years old during the 2016-17 season. If Canuck fans are interested in keeping track of Soderstrom’s play in the near future, he will be playing in the IIHF Under-18 World Championships as a member of the Swedish rear guard. It might be interesting watching this right-handed defenseman who, as people are suggesting, might soon be on the Canucks’ blue line as a partner to young lefty Quinn Hughes. On April 15, David Quadrelli wrote a nice piece about the Canucks’ goalie depth chart. After Jacob Markstrom and Thatcher Demko, he noted the progress of two young Canuck prospects already in the system: Michael DiPietro and Jake Kielly. Canuck fans will recall that DiPietro was the victim of a perfect storm situation where, after being called up from the Ottawa 67’s as an emergency backup, he was surprisingly forced to make his NHL debut against the San Jose Sharks on Feb. 11 after Markstrom was injured earlier that day. 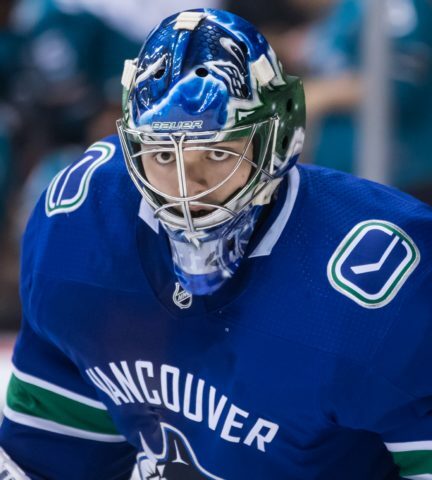 The Canucks, coming off a recent long road trip, really didn’t give DiPietro a chance. The score was 7-2 Sharks, and DiPietro immediately returned to the 67’s. Well, DiPietro survived and prospered. He’s (according to Quadrelli) by far the best goalie in the OHL and will likely be full-time with the Utica Comets next season. At 19 years old, he’s waiting in the wings after Markstrom and Demko. It will be interesting to see how his development goes next season. DiPietro is not alone as a Canucks’ goalie prospect. Kielly, a college free agent signing, just finished his third season with Clarkson University (in Potsdam, New York). The Clarkson University athletics website lists the story of this third-year college goalie. Kielly started all 39 games the team played. He was a finalist for the Mike Richter Award (for the most outstanding goaltender in the NCAA) and was nominated for the Hobey Baker Award (for the NCAA’s top player). He ranked as one of the NCAA’s best in all goaltending categories (26 wins, five shutouts, a .929 save percentage, and a 1.91 goals against average). Kielly signed a two-year entry-level contract after the season finished and has already spent practice time with Canucks’ goalie coach Ian Clark. Kielly has the makings of a potentially good young goalie. He, like DiPietro, will probably be with the Comets next season. Obviously, the NHL Draft will be interesting for the Canucks. First, it is in Vancouver. Second, this season brings the promise of a strong core of young talent. I look forward this coming season to a Canucks’ run to the playoffs and, personally, would be disappointed were that not to happen.